TAR 22 Ep 7 "Be Safe and Don't Hit a Cow"
Topic: TAR 22 Ep 7 "Be Safe and Don't Hit a Cow"
Re: TAR 22 Ep 7 "Be Safe and Don't Hit a Cow"
The Boteti River runs through Maun and on into the Okavango Delta. On the other side of the Delta, the flows out consolidate from 3 prongs into one Okavango River. I expect that the water skiing was on the Boteti River and not the Okavango River. Meno A Kwena is an old-style safari camp, run by David Dugmore, an experienced guide with a real passion for Botswana's bush and for community development . It is situated on tribal land on a cliff edge overlooking the Boteti River, which began to flow again in late 2008, having been dry for over 15 years. The name Meno A Kwena is the local name for the area, which translates as 'teeth of the crocodile'. Meno A Kwena's relaxed atmosphere, warm welcome and the team's keen interest in the surrounding area and its wildlife shine through – as does the hands-on approach of the camp's committed owner and managers. It won't be to everyone's liking – it's fairly rustic, and if you are travelling to Botswana for a pure big-game experience then it's tempting to say Meno A Kwena will not be for you. The return of water to the Boteti has started to change the dynamic here however and often game-viewing from the camp is as good as it is from the vehicle. Looking at the bigger picture, Meno exists right on the transition zone between the unique Okavango Delta region of the Kalahari and the more typical, dryer regions further south - it's this location which makes it special. So, if you are keen to experience something slightly different from the norm with a rather quirky feel and an emphasis on the human side of life in Botswana as well as the wildlife, Meno is certainly worth a visit for at least a couple of nights. The special thanks are what you would expect--except for Roger Dugmore, which may have something to do with next week. Or perhaps they provided the cars teams drove? See the information in the ep. 7 thread. Dugmore owns the Meno A Kwena Safari Camp, which was the pit stop. The owner of the Safari Camp is Roger's brother, David; so that should be the connection. Besides, his tented safaris - Roger's is owner of "Roger Dugmore Safaris" - have similar style of tents as the one in the background of Pam & Winnie confessional. Then you would be wrong. That location on the Thamalakane River is in the same general area where I was getting some hits for Mokoro Station, so that makes sense. For this episode, we spent time at the Royal Tree Game Reserve outside the city of Maun. It's easy to feel at one with nature when you're sleeping in a wonderful tent under the stars on a private reserve on the banks of the Thamalakane River. I found the Royal Tree Lodge site, and has this map. It has marked the place, and I add Maun and what I hope is the correct river. What is this place please?? Is it named? 2 parallel faults now control the direction in which the Okavango River enters the Kalahari Basin, in an area called the Panhandle. Other faults also direct its exit from the Delta, flowing south into the ocean of sand. As the Okavango flows over the Gomare Fault, a continuation of the Great Rift Valley of east Africa, that runs southwest to northeast, the slope of the land breaks it up into numerous channels, which fan outwards over the Delta. These are blocked by 2 southern faults, the Kunyere and the Thalamakane, which redirect the Delta's myriad channels. The Thalamakane Fault acts as a 150-mile-long natural dam: Here the channels abruptly change direction and join to form one river, the Boteti, which flows eastwards through a break in the fault towards the Makgadikgadi Pan. A small channel, the Nghabe River, continues southwest toward Lake Ngami, serving as both inlet and outlet depending on the strength and direction of the annual floods. Unfortunately, Dr. Green does not identify precisely where the change from the Thalamakane Fault to the Boteti river happens. I have also discovered sources which recognize a Thalamakane River (not mentioned at all by Dr. Green). One is tourist literature from the Thalamakane Tourist Resort. 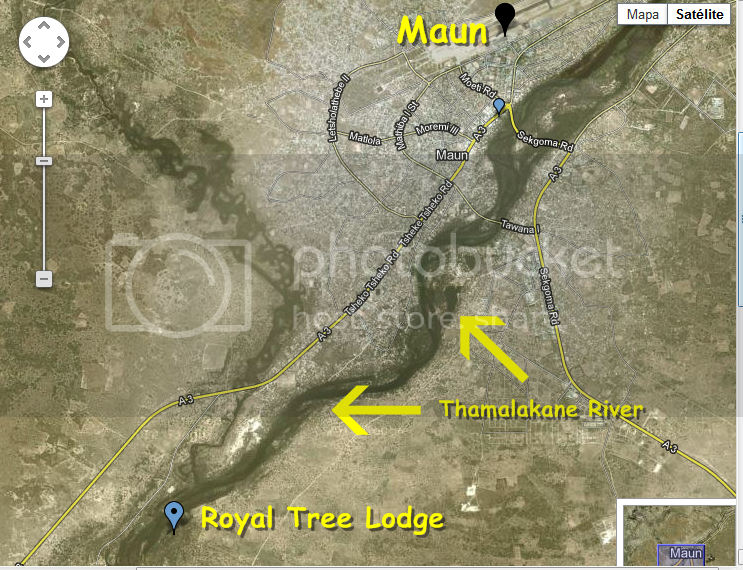 It states "This metropolis (Maun) is now spread out along the wide banks of the timeless Thamalakane River. It also shows photos of canoes being poled. apskip......I suspect that you have a mis-typed word. Unfortunately, Dr. Green does not identify precisely where the change from the Thalamakane Fault River to the Boteti River happens. I can tell you after over 40 years professional experience, that faults do not morph/transform into rivers. They are two completely different landforms. In this case, the Thalamakane River follows the Thalamakane fault. This is because the land on one side of the fault is upthrust, creating a natural dam and redirecting the flow of the river. Last episode there was a question of the right hand drive vehicles that the teams used, since it was brought up that Botswana drives on the right. Photos from this episode completely disspell that notion. It is very obvious that people drive on the left in Botswana. The Thalamakane Fault acts as a 150-mile-long natural dam: Here the channels abruptly change direction and join to form one river, the Boteti. Speeding in Botswana is dangerous, did anybody watch and remember what happened to Brian & Greg in Season 7 when their 4WD flipped over? Who is Dr. Green? Isnt the above your statement? Again......it is the first time I have ever heard of a fault changing into a river? Apskip has merely misunderstood what Dr. Green wrote. To have written those notes he must have visited all those places and wrote them from a perspective of a geographer.